Buy Clip In Hair Extensions? "What are the things I should know about before I buy clip in hair extensions?" It’s easy to buy clip in hair extensions without really knowing what they are or what it is you should know about beyond the texture colour and length; let's face it there are plenty of sites telling you that their clip on hair extensions are the premier type of premium hair and all you have to do is click the buy or add to cart (or add to trolley if you’re in the UK) button... but before you click that magic little button, here are some things to consider before buying your clip hair extensions. 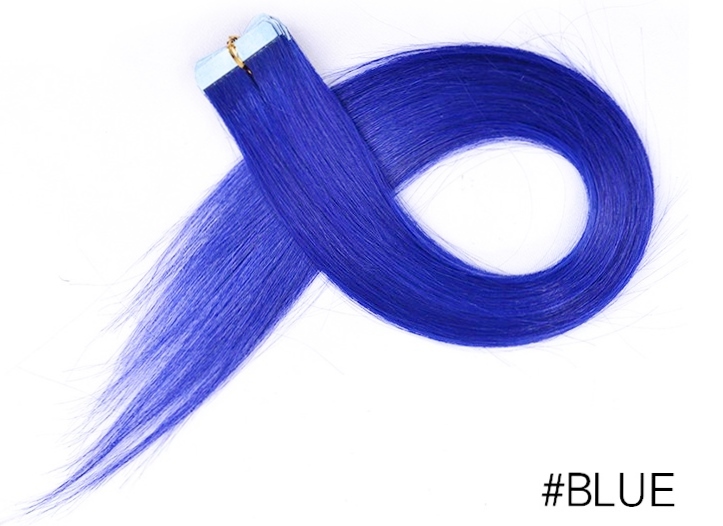 Ok, before you say it, we know that to achieve the blue colour of the hair extensions image above, dyeing must have taken place... but not everyone is buying coloured clip in extensions; in fact most people are choosing more sedate colours such as browns, blacks, reds, and blondes but are unaware that the hair has been dyed to achieve the colour. We know it's a shock, but it's true. The majority of human hair on the market is not black, but rather off black and dark brown and that's the truth, ruth! Some website list hair extensions as "virgin" or "cuticle" without really explaining (or in some cases, it has to be said, not knowing) what these terms are supposed to mean. For many, whether the hair has been dyed won't matter, but for those of you lovely dyeing DIYers it's something you should find out before you buy clip in hair extensions. What a lot of folks don't realise is that darker colours like #1, #1b, #2, #3, #4 have been dyed these colours. Fine...super...great...what's the big deal? Good question; the big deal is that if you try to dye your hair extensions blonde or indeed blue, you'll have to be aware that the hair may take the colour in a way you aren't expecting. As a rule, you always have to lift dark hair colours to very light colours in stages (so supermarket dye-in-the-box won't make jet black hair, red in one fell swoop - sorry, just sayin'), so just bear this in mind when you buy clip in hair extensions. This mainly applies to wavy clip-in hair extensions and curly textured clip-in hair extensions, but it's also good to keep in mind for straight textures too. 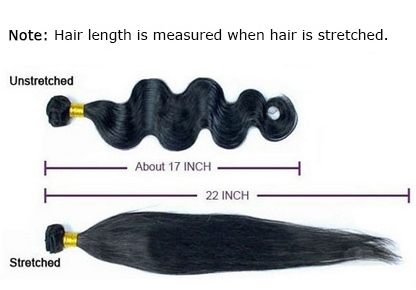 Whenever you choose to buy wavy or curly clip-in hair extensions, remember that the length quoted for curly and wavy hair is measured when the hair is straight (stretched), not the curled or wavy length. The image above shows a wavy 22" bundle of hair extensions measured in its wavy and straight length; when it's wavy it's 17" and when it's straight the length is 22". The other factor relating to length that you should think about with straight textures for clip hair extensions (and actually all textures) is the fact that most hair extensions are not double drawn; they're single drawn. Without boring you with the details double drawn hair has thicker ends whereas single drawn hair (which by the way is the most commonly available type of hair extension) tends to get thinner towards the ends as not all of the hairs are the same length. For some, this can be an issue, but for others it isn't. One way to look at think about it is that since you're wearing clip-in hair extensions, you are adding thickness to your own tresses, so it's no great shake that the hair extensions are thinner towards the ends... at least this means they're likely to blend in more with your own hair. We've all done it; bought something online and when it arrives decide that we don't quite want it anymore... it's human and when it involves cars or houses it's called buyers' remorse; but when it involves hair extensions, it's just called a change of mind. Not all retailers cater to changes of mind and to find out what you should know about returning hair extensions, check out our guide and find the three areas that mean in the UK you have a right to return your item. If you'd like to keep up with new info, then why not join our blog - it's easy to do and doesn't require any personal info - yippee!